For a crafty mom a baby scrapbook kit is the perfect gift. Even for those not so creative, scrapbook kits make it so easy to put together a beautiful and impressive looking scrapbook. It is a project anyone can enjoy doing, and everyone will enjoy looking at it when it is finished. Babysakes is definitely one of the best places to shop for any kind of memory book. 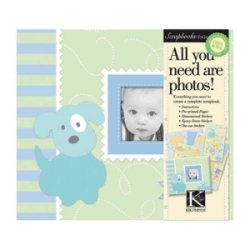 They also carry a great selection of complete baby scrapbooking kits. Sweet Pea Baby Boy 8.5x8.5 Photo Scrapbook To Go by K&Company is a pre-printed scrapbook. All you have to do is add pictures to the printed background pages, and then embellish with the stickers provided, which match every page. A very easy to use sort of scrapbook kit. Baby Girl Scrapbook Complete by C.R. Gibson is another pre-printed design which comes with embellishment stickers and caption stickers as well. When I am putting together a baby scrapbook kit for a friend or family member I like to go all out. For those of you who want to really go all out and put together the ultimate kit I suggest shopping at actual scrapbook shops either or locally. When shopping online I like to shop at Scrapbook.com or AcherryonTop.com. You can even put together a baby scrapbook gift basket! You can even get away with purchasing a scrapbook album and then a few page kits which come as a kit that has just enough color and theme coordinating papers and embellishments to put together one full page. Another really good buy is to buy a paper pack, which is an entire book full of coordinating papers.